Electric start with battery included. Locking, folding handles and never-flat wheels are included. External battery charge jack for added convenience. 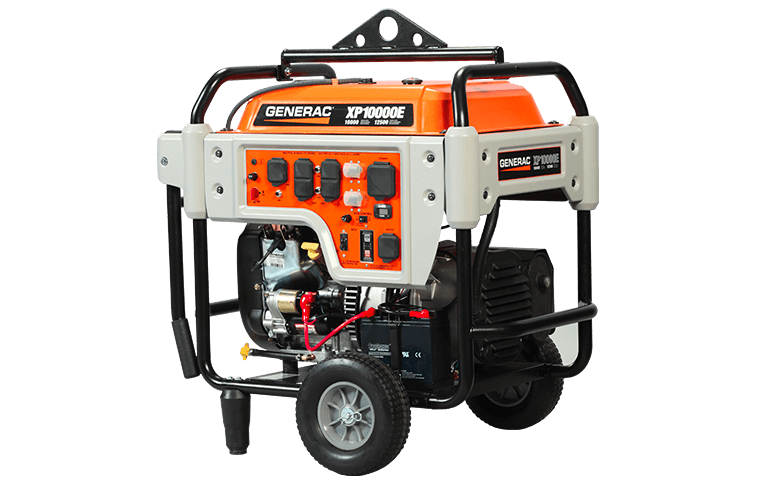 Rated 2 out of 5 by Idahogreg from Do not recomend I had high hopes when I bought the Generac XP 10,000 E to run my remote well pump. My pump is 5 HP and is 650 feet deep and requires a minimum of 7,500 watts and 28 amps to start. I thought the XP 10,000 E, 50 amp generator would easily run this pump. Unfortunately the Generac wouldn't start the pump. This generator was advertised as a 10,000 watt 50 amp generator. It may produce 10,000 watts of power, but it doesn't have a 50 amp breaker. I have a cheap China made 8750 watt generator that out preforms the expensive Generac. I'm selling the Generac and writing it off as an expensive mistake. I'm very disappointed with this purchase. Rated 3 out of 5 by TommyS from Former Wisconsonite -buyers beware Works great - if you know its limitations, Conversations with Generac didn't go as hoped - very proprietary. Two calls confirmed I can expect ZERO help on tech. issues. Example: the XP10000E works great as house back-up power supplier but if you are using it with a power transfer switch you MUST separate the internally connected Neutral and Ground wire first. Generac WILL NOT tell you how/where to find it. Rated 1 out of 5 by Jon from Disappointed I have owned this generator for about 4 years with only 120 hours on it. I have never used it to power my house during an emergency. I have had problems with it from the first day I purchased it. I have tried to get it serviced while it was under warranty but Generac was of no help. I have used a smaller back up generator. I just can't get this unit to run for any length of time before it cuts out. I have at great expense tried to fix this unit. Hoping someone could help me. It looks and sounds great just very undependable. Rated 4 out of 5 by CTYankee from Replaces a Generac EXL-8000 I bought this model because of its portability - the wheels for short distance movement, and the lift eye for transport using my tractor. Also important was its ability to produce 'clean' power so that my fear of using my computer while on back-up power would be minimized. Have not yet had an opportunity to test it for home back-up, and hopefully never will. Once my transfer switch and inlet receptacle are installed we will give it a thorough test. The GFCI protection on this unit made selecting the correct transfer switch a bit more challenging. But that is all figured out and I expect to be able to power almost 100% of our home once everything is installed. I do not yet have enough hours on this unit to feel qualified to comment on its total performance and reliability. Rated 4 out of 5 by Bud from Performed as advertised bought to power sensitive electronic equipment such as a UPS, Comm switches, etc. during short term scheduled power outages. The unit performed as advertised without issue. Rated 1 out of 5 by Don from Cheap Parts To be perfectly honest I never even got a chance to use this product. I recently bought it new and the very first time I went to start it the cheap, plastic choke pull broke off and it was not possible to start the machine. I contacted Generac without resorting to write a review and they responded with a prepared and canned letter that showed they did not care about the quality of their product. If a small part, like a choke pull s so cheap that it falls apart even before the first use then I will logically assume that it is cheaply built overall. Rated 5 out of 5 by Snowman from Lots of Power Seems to have more than enough power for my use(s) Nice quiet operation. Electric start is a very nice feature to have. Rated 5 out of 5 by TKelly from Great mix of features Love the generator. Would buy it again if I needed another. A couple things I would like to see changed for future models. - "Idle Control" feature - you can just remove this. It is not stated explicitly or implicitly anywhere, but when idle control is active, the generator produces 85V, which I hard am hard pressed to think of an electronic device you would want to torture with this voltage. It is supposed to detect load and increase engine speed, but you can load it with quite a few things before it recognizes the need to exit idle control (e.g. refrigerator, coffee maker, fan...all running simultaneously did NOT trigger idle control override). - Easier use for home power. This specific model requires a mod on the 50A outlet to use this for home power. I realize this may be used extensively as an on-site gennie for construction sites, but it is the only "home" model that is compatible with sensitive electronics (i.e. it produces a "pure" sinewave). Given this, it should be a natural that people would want to use this for home power in an outage. I am currently jumping through hoops to make that dream a reality. Something else that is hinted at in the manual, but isn't entirely clear, is the fact that it really must be run on a level surface. I was running it when it couldn't have been more than 10 degrees off level, and it simply wouldn't produce power at the receptacles. Once I put it on a purely level surface, everything worked just fine. In spite of all this, I am quite happy with the generator. Nothing else out there equals the features the xp10ke has. XP10000E is rated 3.9 out of 5 by 14.